Men with guns threaten women online, via email, text or on social media every day. These threats rarely show up in the news unless the woman is shot at, injured or killed. In an average month, 50 American women are shot to death in a domestice violence case. When we look at the background of shooters after the fact we often see a history of domestic violence and threats, which leaves people wondering what they could have done to prevent it. 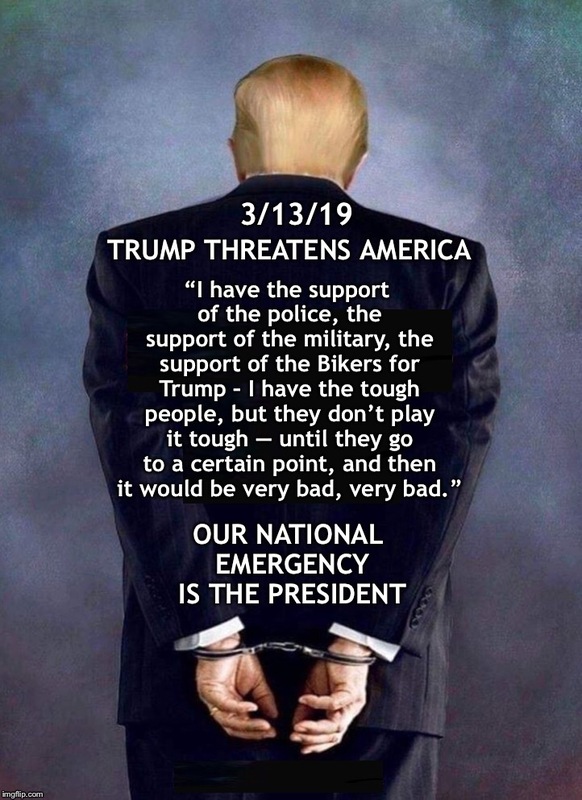 In this case study our hero, Morena Hockley, didn’t ignore the threat, she did research and found out that the man making the threat was a law enforcement officer. She then demanded an investigation by his employer and got it. What happened after the investigation is also a very important part of the story and that I want more people to learn about. Disclosure: I know Morena Hockley through my work on Gun Violence Prevention. I advised her on talking to the press. The photos are in this piece were obtained directly from Hockley or from Facebook. Here’s the story in the San Antonio Express. 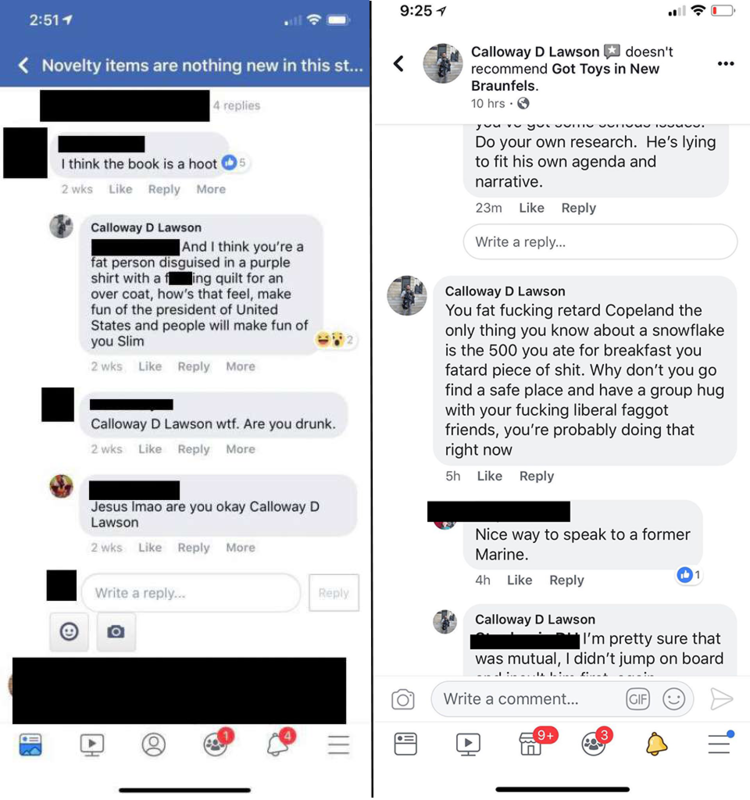 Precinct 3 Deputy Calloway Lawson, who works part-time for the constable’s office, was apparently upset over comments from people who supported the book store and criticized Trump in their comments. And he let them know how he felt. Others were more disparaging, insulting people’s size and appearance and using homophobic slurs. Some of his comments, like those making fun of a poster’s name, were trivial. “Why don’t you go find a safe place and have a group hug with your f***ing liberal f****t friends, you’re probably doing that right now,” he wrote. “Too bad a book hurt your feelings so badly,” she wrote. In response, Lawson posted one of Hockley’s Facebook profile pictures with a mocking caption. Lawson’s behavior allegedly led to multiple users reporting him, which led to the deletion of his Facebook review and a temporary ban from the social media site. That’s when the reserve deputy allegedly singled her out, found her email address and sent her multiple messages on Dec. 8, 2018. Hockley said she didn’t report Lawson’s comments and wasn’t sure why she was being targeted. Lawson later told an investigating sergeant he though Hockley owned the store in question. “Do you actually think it was smart getting me kicked off Facebook for a week I’m coming for you you f***ing c**t I’m coming for you,” his first email read. Lawson sent a second one a minute later that read “every time I look at your f***ing horse mouth in that giant f***ing billboard of a smile you have I think of Mr. Ed, I can’t wait to see you soon,” the second email read. Lawson did not respond to mySA.com’s interview request seeking comment on Monday. Hockley didn’t know that though. She saw a law enforcement officer sending her what she perceived were threats, she said in an interview with mySA.com. That did not quell Hockley’s fears, she said. She asked Garden Ridge police to provide extra patrols by her house and put up a camera outside. Hockley also filed a formal complaint with the constable’s office against Lawson a month later, on Jan. 8. Sgt. 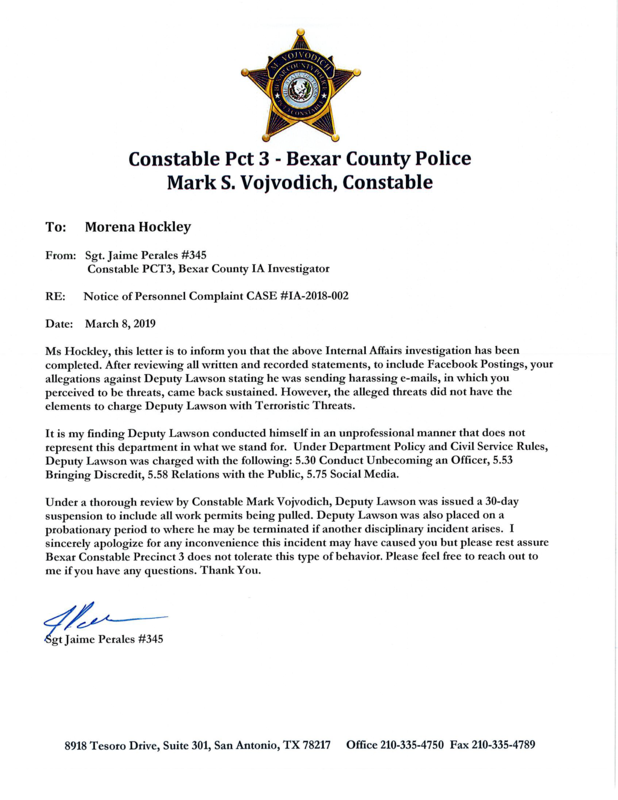 Jaime Perales investigated Hockley’s complaint and submitted his report to Constable Mark Vojvodich who suspended Lawson for 30 days, pulling his work permits, which prevents him from working off-duty. Lawson was also placed on probation for the remainder of his employment with the constable’s office. “We’re sorry it turned out the way it did because Precinct 3 doesn’t condone that language or behavior,” Perales said. “He regrets it, he said everybody left negative comments so he left negative comments,” Perales said. Perales said Lawson told him that, “I’m coming for you,” meant he was planning on posting more negative comments when he was allowed back on Facebook. “At no time did he mean that he was going to physically harm her,” Perales said. At this point most stories about complaints based on threats end. But when Hockley got the letter from Precinct 3 she thought the punishment was too lenient. Several people suggested she take the story to the press, which she did. He recast Lawson’s intent to something that didn’t rise to the level of a firing offence. This recasting happened months later, only after Lawson got in trouble for making the threat. What doesn’t usually happen is a reporter challenging the credibility of an explanation, the redefinition of a term or a different interpretation of a law than is commonly understood. When Hockley spoke to the reporter again and heard what the officials had to say she was able respond to their answers about why she was still concerned and explained her next steps. The San Antonio Express story continues. The woman initially pleaded guilty to the charge, according to the University of Michigan’s National Registry of Exonerations, but the conviction was vacated because of her poor legal defense and Lawson’s questionable behavior. Perales said he was unaware of Lawson’s past and that it was not part of his investigation. “I spent the past three months looking over my shoulder,” she said. 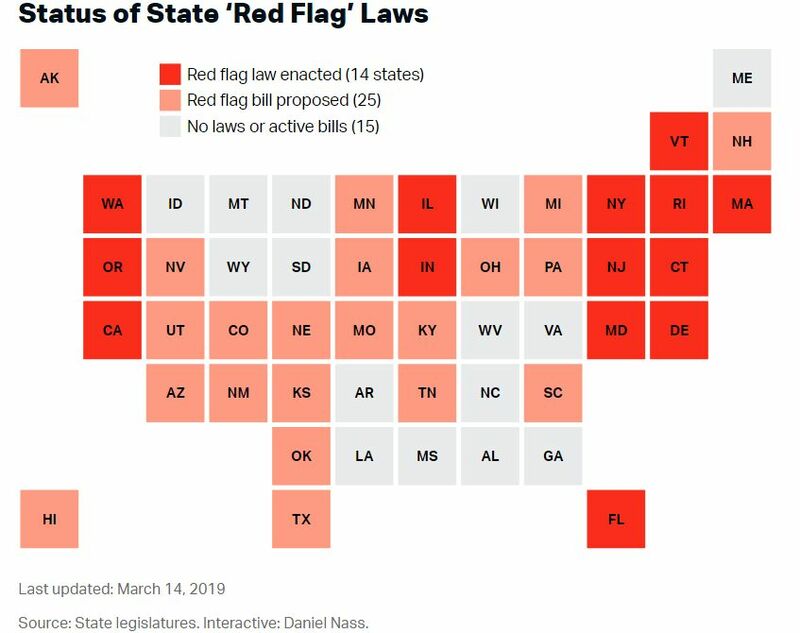 California now has ERPO laws, but many people don’t know how to use them. Some GVP groups, DAs and police department officials in California are traveling around the state educating people on the laws.